The Weekend Gourmet: My Italian Flag PLT Wins Honorable Mention in the King's Hawaiian Ultimate Sandwich Contest! My Italian Flag PLT Wins Honorable Mention in the King's Hawaiian Ultimate Sandwich Contest! I hope that everyone had a fabulous Thanksgiving! We’re spending the long holiday weekend back home with our families in Houston. Time spent with family and friends enjoying some fabulous food is truly something to be thankful for! Speaking of thankful…I’ve got a fun sandwich recipe to share that you’ll be definitely be thankful for once you try it! Earlier this Fall, I was invited to take part in King’s Hawaiian’s Ultimate Sandwich Contest. I played around with a couple of recipes, ultimately submitting my Italian Flag PLT. 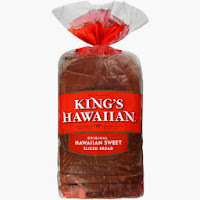 My sandwich creation features delicious King's Hawaiian Sweet Sliced Bread. I was thrilled to find out a few weeks later that I received an Honorable Mention award! My prize was a year's worth of yummy King’s Hawaiian products! I realized the other day that I never shared my winning recipe with you, so I thought this was the perfect time to change that! This sandwich is an Italian twist on the all-American classic BLT. It’s full of flavor and really easy to whip up…making it a fabulous quick dinner option during the hectic holiday season. This sandwich features crispy rounds of pancetta, fresh creamy mozzarella, lettuce and tomato, your favorite pesto and a creamy parmesan-balsamic spread. This sandwich is good…really good! minutes. While the pancetta crisps, slice the tomato and mozzarella. Step 2: Make a spread by combining the mayo, parmesan, balsamic vinegar and salt & pepper to taste. Refrigerate until you assemble the sandwiches. Step 3: When the pancetta has cooked, drain on paper towels to remove excess grease. Toast the King's Hawaiian bread slices. Spread the balsamic mayo on the bottom slice of toasted King's Hawaiian bread. Top with two pieces of the fresh mozzarella. Step 4: Drizzle half of the olive oil on top of the mozzarella, then top with 4 slices of the pancetta.. Top the pancetta with the sliced tomato and lettuce. Spread the pesto on the top slice of toasted King's Hawaiian bread and place on top. This sandwich is SO good! The toasted sweet Hawaiian bread, savory pancetta, and herbal pesto flavors work really nicely together…and the tangy spread rounds it all out. I love serving this sandwich for simple dinners. It’s casual, but it still feels a little fancy. Everyone who’s tried this sandwich goes nuts for it, so I hope you’ll give it a try soon and let me know what you think!